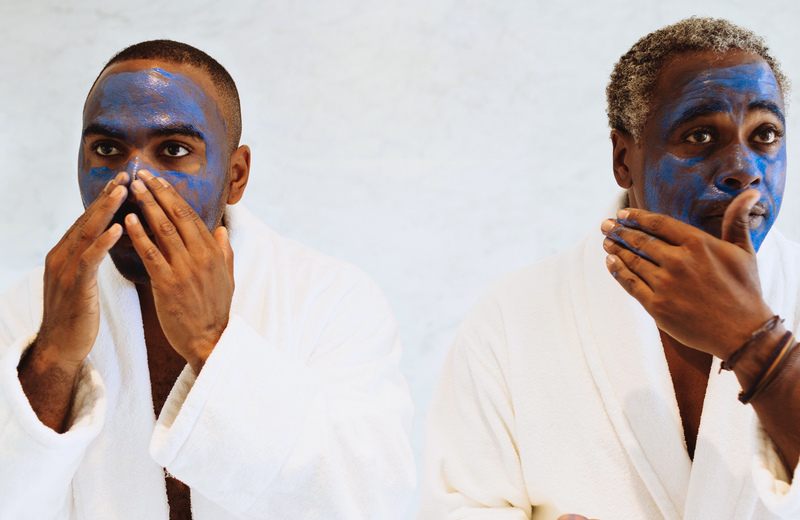 Wellness trends are expanding into a surprising new market – male skincare. If your guy cares about grooming his beard, level up his skincare with natural products that nourish his face and smell much better than drugstore brands. Here are our favorite natural skincare products for guys. This longtime favorite organic skincare brand always appealed to guys with its no-fuss, unisex packaging. Now John Masters Organics has launched their first line made just for him. Guys love the 2-in-1 solutions, like moisturizer that doubles as aftershave and this face wash that also works as a shave foam ($22). The eucalyptus and agave scents will have him smelling fresh and woodsy. Ease him into better skincare with SkinCanDo’s Combat Ready Balm ($13.50), for a post-shave nourishment. Packed with coconut, apricot kernel, and beeswax, this all-natural product stops red bumps and inflammation. Its military aesthetic makes it man-friendly. Certified by the Vegan Society, this natural product will protect your sensitive guy’s skin and beard. Benecos Beard Oil ($13) is loaded with sweet almond, sunflower, and argan oils for moisture and scented with rosemary and lavender essential oils, which do double duty. In addition to the aromatic boost, the oils fight dandruff and prevent infections. Help him stay hydrated with this unisex fave that fits in his gym bag, making post-workout moisturizing super easy. The Yes to… brand is 98 percent natural, and this product is loaded with skincare darling coconut oil. The stick format makes Yes To Coconut Moisturizing Coconut Oil Stick ($9.99) easy to apply and will never leave his fingers greasy. Prada Lab’s unisex products look like Aesop, but they are all-natural – unlike Aesop’s. He’ll like the apothecary look and feel of the product, and you will love his new smooth skin and glowing complexion. The Hydrating Facial Cleanser ($29.99) is made with volcanic ash, which is a type of clay that purifies and hydrates the skin. With these brands, guys will find natural skincare products for all skin types and skincare needs. And for extra help, a skincare professional is just a book button away!